Five Reasons Why You Will LOVE Cloud 9 Leisure! Cloud 9 is a new and incredibly exciting inflatable world, for all ages, where Ninja Warrior, Total Wipeout and Gladiators experiences collide. UK LAUNCH – NOVEMBER 2017! 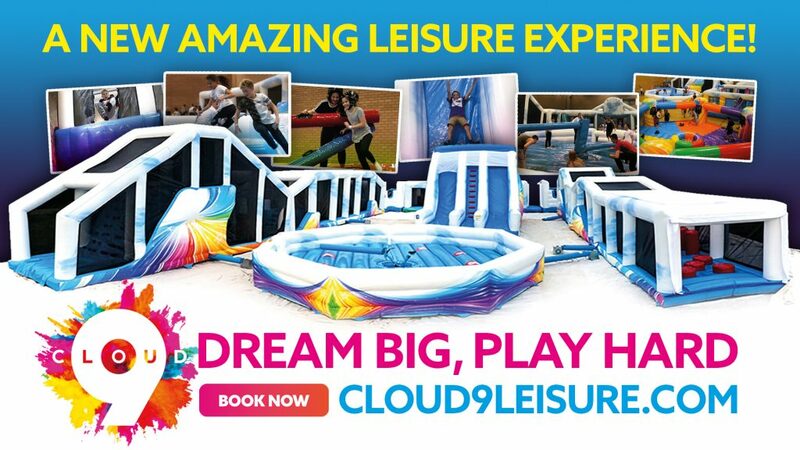 If you are a fan of Gladiators, Total Wipeout and Ninja Warrior then Cloud 9 leisure is going to be right up your street. It’s the perfect blend of all of these, plus a few extra surprises. So whether you want to have fun with friends, or if you want to push your limits / prefer the thrill of competition, there is something here for you. Cloud 9 offers a huge variety of incredibly fun inflatables and activities that will challenge you and keep you coming back for more. We have everything from a giant obstacle course, dodgeball, the sweeper and human table football, to a gladiator duel, an interactive bungee run, a giant slide plus many more surprises in store for you. All of these activities are supervised to ensure you remain safe whilst having as much fun as you can. Cloud 9 activities are suitable for everyone who is over 1m in height and under 18 stone / 115 kgs. Unlike many other leisure experiences across the UK, Cloud 9 offers the perfect mixture of competitive activities and fun for all ages. All of our inflatables and games are designed to be enjoyed by everyone from the young adventure seeker, to adrenaline fuelled teens and active adults who remain young at heart. As they say, age is just a number. You might well find yourself with a 10 year old to your right, and a 45 year old to your left. Cloud 9 is all about being inclusive and bringing everyone together to enjoy some good old fashioned fun. We know once you see and experience it, you will absolutely love it. Cloud 9 will be open on weekends and school holidays throughout the year at our first four venues in Potters Bar, Rickmansworth and two in Watford. The fun packed inflatable world of your dreams in now a reality, so come down any weekend and any day during school holidays to test yourself in what will be a truly memorable experience. Our core belief at Cloud 9 is to encourage active and healthy interaction, whether that’s competing against others or just to have fun. One thing is for sure, Cloud 9 will definitely get you moving and keep you active. For those seeking more of a challenge, the Cloud 9 Xtreme Games will start in 2018. If you are interested, you can enter either by yourself, or in a team (email us at info@cloud9leisure.com if your are interested). C9X Games will be held at various times throughout the year and the top 10 in each of the 3 age categories will be eligible to compete in the Annual C9X Games where awards and prizes will be given out. All winners and leaderboards will be on the website. So what are you waiting for? Cloud 9 has finally arrived. Come and join us for what will be an unforgettable experience.